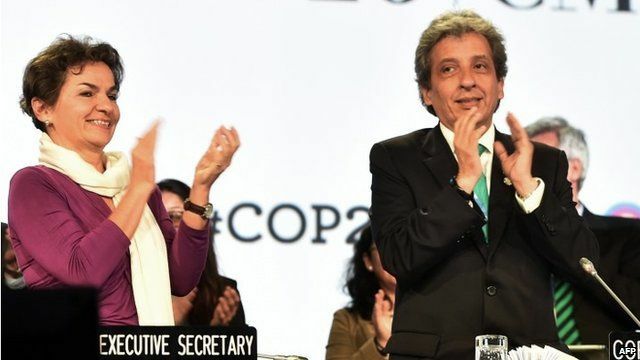 'Sense of relief' after climate deal Jump to media player Delegates at United Nations climate talks in Peru have broken a deadlock on how to move forward with plans to combat global warming. Will climate change meeting make a difference? Jump to media player The last 14 years are among the 15 hottest on record - can the latest UN talks on climate change reach agreement to halt that trend? In 60 seconds. 'Climate change inaction will cost' Jump to media player The unrestricted use of fossil fuels must end soon if the world is to avoid dangerous climate change, according to a new report from the UN-backed IPCC. Fossil fuels 'must go by 2100' - IPCC Jump to media player The unrestricted use of fossil fuels should be phased out by 2100, if the world is to avoid dangerous climate change, a UN-backed expert panel says. Delegates at United Nations climate talks in Peru have broken a deadlock on how to move forward with plans to combat global warming. Negotiators backed a document setting out the ways in which all countries will tackle global warming. Go to next video: Will climate change meeting make a difference?